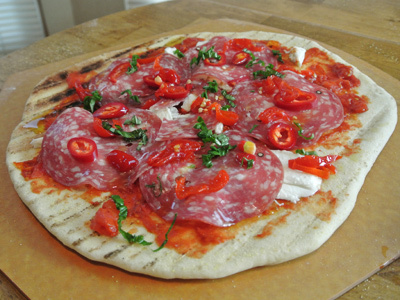 One of my new favorites is the Sopressata pizza with Calabrian Peppers that they make over at “Spin Neapolitan Pizza”. Their pizza is so good starting with the crust made in a huge fired up pizza oven down to the original toppings that you don’t find anywhere else. I’ve been dying to try this at home but with the recent heat it didn’t seem like a good idea to crank up the oven to 500 degrees in an already hot kitchen. One way to achieve my summer pizza would be to grill it outdoors. I haven’t grilled a pizza in a long time, don’t know why, possibly because it requires focus and timing and I am one who can be easily distracted. 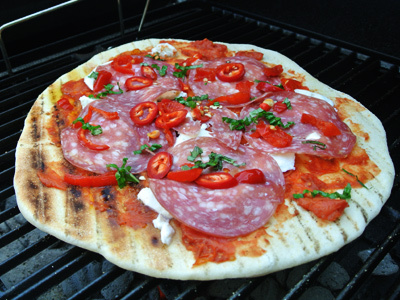 I don’t have enough room on my grill to make two pizza’s at once so I will have to be on my toes, grilling one side, then flipping it over and removing to add the sauce and toppings while I grill the other pizza dough. Just about the time I have the toppings on the first pizza it’s time to flip the second pie dough. Now place the topped pizza back on the grill to finish baking while I add sauce, cheese and toppings to the second. Are you confused yet?? If your grill is properly heated at an intensely high heat the pizza will grill fairly quick with nice grill marks and a smokey flavor for one of the tastiest pizza’s you’ll ever make but WHEW. . . I wasn’t so sure I could keep up!! In the end it was worth the effort when the guys told me how much they loved it. I wanted a thick tomato sauce that would compliment the rest of the pizza. 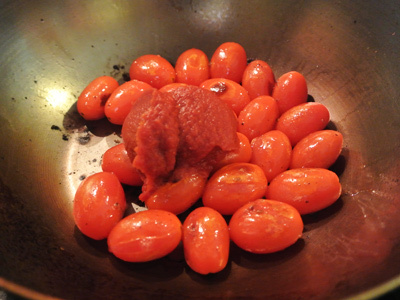 It should taste fresh and made simply from tomatoes, olive oil, salt and pepper, thickened with a bit of tomato paste. 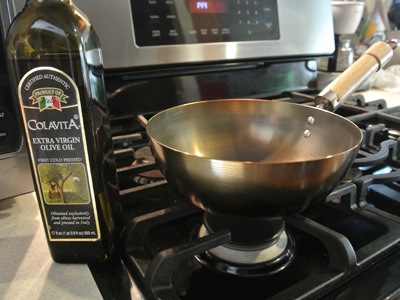 Start by heating a small saucepan to medium high heat and add a drizzle of olive oil. Add a cup of cherry or grape tomatoes and toss to coat with the olive oil. Add a sprinkle of salt and pepper and toss some more. 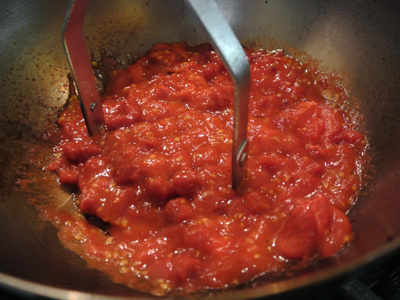 When they begin to soften and are almost bursting, add a tablespoon of tomato paste. For quick work use a potato masher to crush the tomatoes and paste together. Taste to see if you’ve got enough salt and pepper. 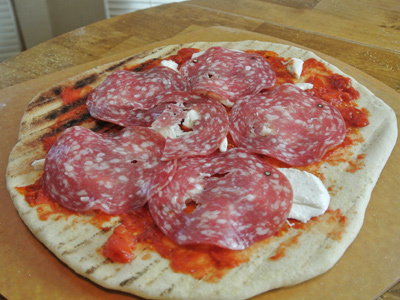 In addition to the crushed tomato sauce you’ll want some sliced Sopressata and fresh mozzarella. I went with some Red Fresno peppers and some Peppadew peppers to make the perfect combination of hot and sweet peppers. Some fresh basil tops it with a little green. Roll out your favorite pizza dough. Slide the first dough onto the hot grill and close the lid. After just a few minutes (about 3 minutes here) the dough begins to bubble and brown on the bottom. Take a peek and when you see those brown grill marks on the bottom, use tongs to remove the dough and flip over to the other side and add your toppings. For me I removed the dough and placed the 2nd dough on the grill to begin browning. While the 2nd dough is on the grill I’m going to top this pizza. 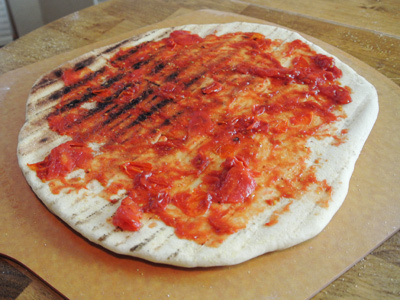 Begin by spooning about half of the crushed tomato sauce onto the browned side of the dough. Add some pieces of fresh mozzarella. And about half of the Sopressata slices. 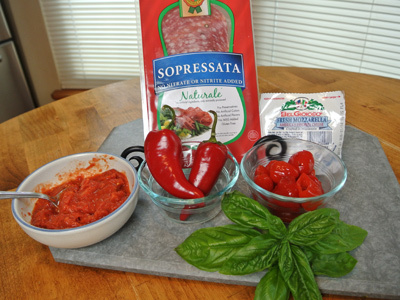 Finish by spreading half of the sliced red fresno and sweet peppadew peppers and a sprinkling of sweet basil leaves. Drizzle with olive oil and it’s ready to go back on the grill to finish grilling, about 3 – 4 minutes. While this one is on the grill I’m going to top the 2nd pizza dough. 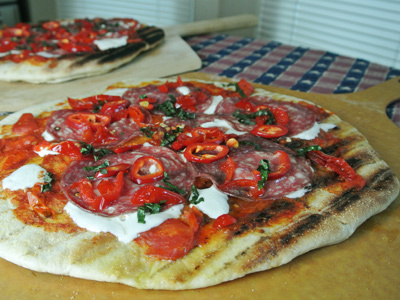 And there you have it, 2 grilled Sopressata Pizza’s with Sweet and Hot Peppers!! You can see I had one edge that got a bit overdone but it really didn’t taste as burnt as it looked. The rest was deliciouso!! 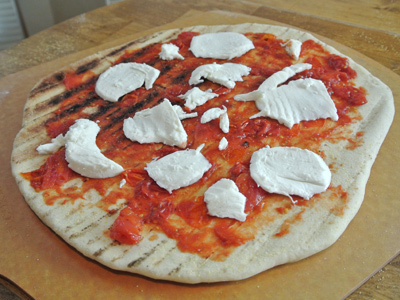 Prepare pizza dough according to recipe at least 2 hours prior to grill time. Dough can be made in advance and placed in fridge until ready to use. 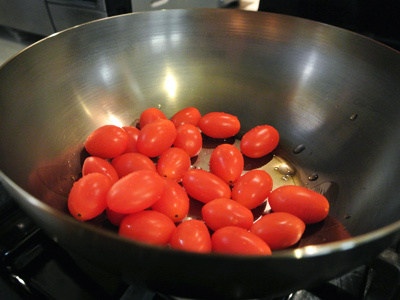 To make cherry tomato sauce, heat a small saucepan over medium high heat. Drizzle olive oil in pan and add the cherry tomatoes. 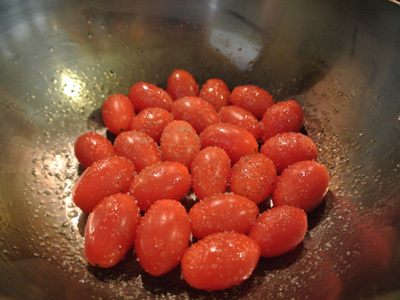 Toss the tomatoes so that they are coated in olive oil. Sprinkle with salt and pepper. Continue tossing while the tomatoes begin to roast. After about 4 – 5 minutes the tomatoes will begin to char on the outside and be almost bursting. Add the tomato paste and crush tomatoes until you have a thick tomato sauce. Taste and add any salt and pepper if needed. Set aside to cool. Heat a charcoal grill with hot coals. 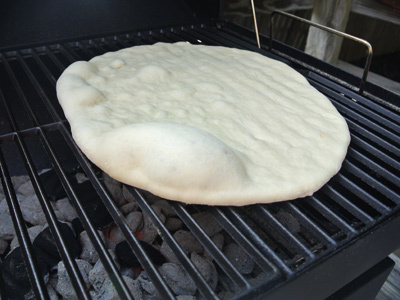 When coals turn ash white, arrange primarily on one side of the grill and leave the other side for your pizza dough. Divide dough in half. Sprinkle a pizza peel with cornmeal and roll out dough approximately 12 – 14 inches. Slide on hot grill and let grill about 3 minutes. Remove and flip the dough over when the bottom begins to brown and you can see grill marks. If grilling a second pizza, slide that dough on to the hot grill while you top the first pizza. Top the grilled side of the dough with half of the tomato sauce, fresh mozzarella cheese, Sopressata slices, pepper slices and basil leaves. As soon as the 2nd dough has sufficiently browned on the bottom, slide it out and flip over. Now place the topped pizza back on the hot grill and let cook for 3 – 4 minutes. 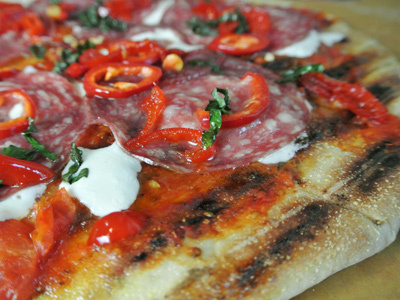 Top the 2nd pizza with remaining ingredients and be ready to pop onto the grill as soon as the first pizza is done.